Is it just me or did this college football season rip on by? It seems like last week I did a preview of Oregon’s first game, and now it's conference championship weekend. Hell, it's already December. What happened? I guess I was busier than I thought, which doesn't seem likely. But here we are anyway, it's time for the Pac-12 Title game, and the Ducks are nowhere to be seen. But they’re still making waves, with the fortunate announcement that Marcus Mariota will return next year. I didn’t think he’d jump to the pros this year anyway, but his knee injury and two November losses pretty much sealed it. I think if you look at what happened to the last Oregon quarterback who left after only two years (Darron Thomas), and the Pac-12 already-top-5 QB choice who stayed that extra year (Andrew Luck), Mariota's decision seemed fairly easy. Although Matt Barkley might have a differing opinion. 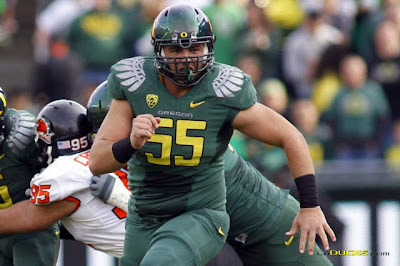 Who gets more than a bit overlooked in the “Oregon player returning next year” scenario is Hronis Grasu, the center. All football people will tell you that a good O-line means the difference between having a decent quarterback and a quarterback who can help you win the big one. My favorite example here is that Mark Rypien won a Super Bowl. My second favorite example is that Trent Dilfer won a Super Bowl. My third favorite example is that Archie Manning never played on an NFL team with a winning record. These three quarterbacks have an offensive line in common. Or a lack of one. So Grasu's return will mean much more than you might thinkg when it comes to Mariota's success next year. I believe both will look better in the 2015 draft because of it. And Oregon head coach Mark Helfrich can sleep a little easier while on the recruiting trail this winter. But the Ducks got a while to hang out before figuring out where they're going bowling, because there's a Pac-12 championship game to be played on Saturday (4:45 PT, ESPN). Stanford and Arizona State are in this showdown, and they already played this year. It was the conference opener for both teams back in September. The Cardinal led it 29-0 at the half and 39-7 at the end of three, but ASU scored three times in the fourth and it felt like if the game had been 5 quarters, the Sun Devils would have won it. 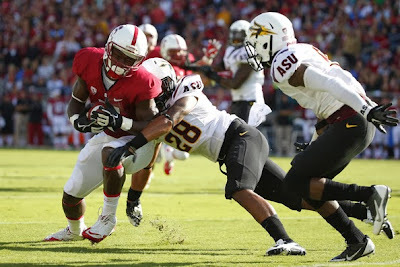 That game was in Palo Alto, the Sun Devils get to host this one. As it happens, that loss to the Cardinal was Arizona State's only Pac-12 loss, and aside from a fluke they-got-hosed loss to Notre Dame two weeks later, they'd be 11-1 and bucking for an at-large BCS bid no matter what happens Saturday. However, that fluke Notre Dame loss merely makes up for the fluke win they had the week before Stanford, the Wisconsin game. That's the one where the Badgers were in position to kick a field goal and win in the final seconds, but the Wisconsin quarterback sort of lay the ball on the turf instead of spiking it, and in the confusion, time ran out. Still, it does feel like an odd conference title game matchup because even at 10-2, Arizona State doesn't feel that good. I don't know if that's because I haven't really paid attention too much to them this year... or because the only times I did, they only beat Utah by a point, Oregon State blew themselves up in the desert (of course the Beavs have only won once in Tempe in the last 40+ years. So there's that), and they almost gave up a huge lead to UCLA. 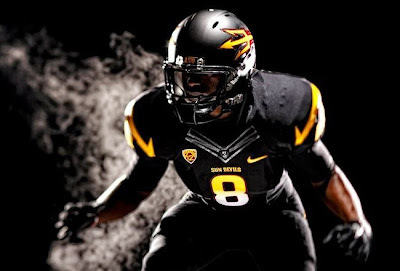 Which makes it weirder that the Sun Devils are hosting the title game because they have the best conference record. Their only conference loss was to Stanford, but Stanford lost to both Utah and USC. Compounding the oddness about this game is that I just don't think the Stanford offense can put together a complete game anymore, if in fact they even could in the first place. I mean, their run game is great, we know that, but Kevin Hogan is not that good a quarterback and nobody is saying this out loud. The times Stanford’s been in trouble this season is when they've thrown the ball. David Shaw and the Cardinal coaches say that the reason they lost at Utah is because they threw the ball too much. Well, why did you gameplan to throw the ball so much? That I don't understand. Then, in the second half of the loss at USC, the Cardinal went six straight drives without scoring and had just 88 yards of offense, 75 of those coming on a drive that ended with- you know it- an interception. Should be no shocker that the Cardinal are 11th in the conference in passing offense. I'm trying to logic all this stuff together to take Arizona State.... but.... come on, this is Arizona State we're talking about. They should probably win this game, but they haven't shown to me that they belong in the conversation of “best Pac-12 football team.” A win Saturday pretty much proves that they are, because then they'll have an actual banner. They need to actually do it before I will admit it. If Stanford wins, nobody will be that surprised. If the Sun Devils pull it off, I'll be surprised, and so will a bunch of other people. "Welcome to Del Taco, I'll take your order whenever you're ready." 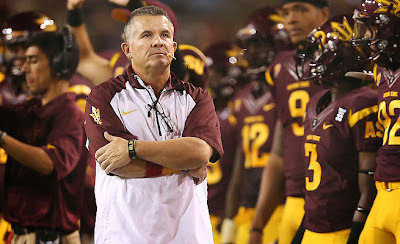 I need to mention Todd Graham here, the Arizona State coach, because he's really the reason I can't take the Sun Devils. He's the guy who spent a year head coaching at Pitt, swearing it was his dream job- before bolting for ASU and swearing this was his dream job. It's not much of a confidence builder if you keep saying that. 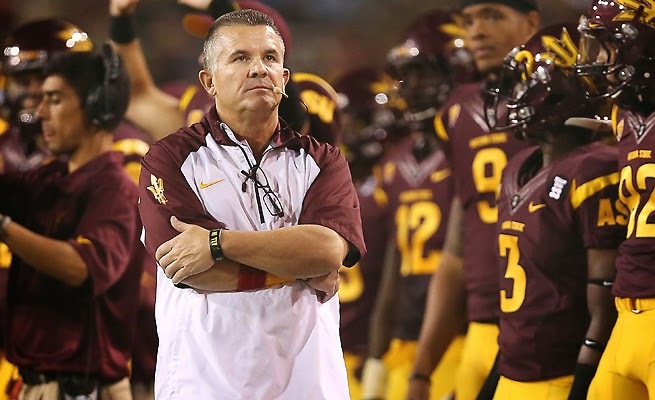 I remember that Rich Rodriguez got hired at Arizona, and Graham got hired at state within days of each other. It seemed like ASU was desperately trying to play catch-up. So I didn't trust the guy then, and I don't trust him now. Think about it this way: if the talent were even on both sides, would you take David Shaw, Stanford’s head coach, or Todd Graham? Oh, that's right, you'd take Mark Helfrich. I forgot who I was talking to.